Patella fracture is uncommon in pediatric age group and their patella is better preserved in any class of patella fracture. We reported a case of a 13-year-old male with right patella fracture nonunion. He had open reduction and internal fixation using tension band wire device. Fracture union was monitored with serial radiographs and he was followed up for 60 weeks. There was articular surface step after surgical fixation of the patella fracture. At 34 weeks postoperative, there was complete remodeling of the articular surface with good knee function after removal of the tension band wire. Children have good capacity of bone remodeling after fracture. Little retropatella step in a child after patella fracture surgical fixation will remodel with healing. This is the first case of patellar fracture in a child from my center, and there is paucity of report from local literature. A 13-year-old male patient was referred to our facility, Ekiti State University Teaching Hospital, Ado-Ekiti, Ekiti State, Southwestern Nigeria, with complaints of right knee swelling and difficulty in walking well of 2 months duration. His problems started when he hit his right knee against the edge of wooden table while playing in school, following which he developed pain at the knee with swelling and was unable to walk well. He presented at the referral center, where about 4 ml of blood was aspirated from the knee joint and the joint was crepe bandaged. He was given analgesics and antibiotics. The pain subsided over time and the swelling reduced in size; however, he was not able to walk well and this necessitated the referral. At presentation, he was a fit young boy, with main findings on the right lower limb. He walked with a limp, quadriceps muscle wasting, and swollen knee. There was anterior knee tenderness on deep palpation and palpable defect at distal part of the patella. There was no demonstrable knee effusion. There was painless movement between the proximal and distal patella fragment. Active range of motion (ROM) across the knee joint was 45°–120° while passive was 0°–130° and intact distal neurovascular function. Radiographic film of the right knee [Figure 1] showed fracture at the inferior pole of the patella with minimal comminution. A diagnosis of right patella fracture nonunion was made. He was worked up for surgery. The surgery was done under general anesthesia, with prophylactic antibiotics, use of surgical tourniquet, and expressive exsanguinations. Fracture site was exposed through a midline incision. Intraoperative findings were a transverse patella fracture at the junction of proximal two-third and distal one-third with minimal comminution and interposed fibrous tissue. The fibrous tissue was excised, fracture ends freshened, and fragments reduced and were held in place with tension band wire device. Wound was sutured and Plaster of Paris full leg back slab splint was applied. 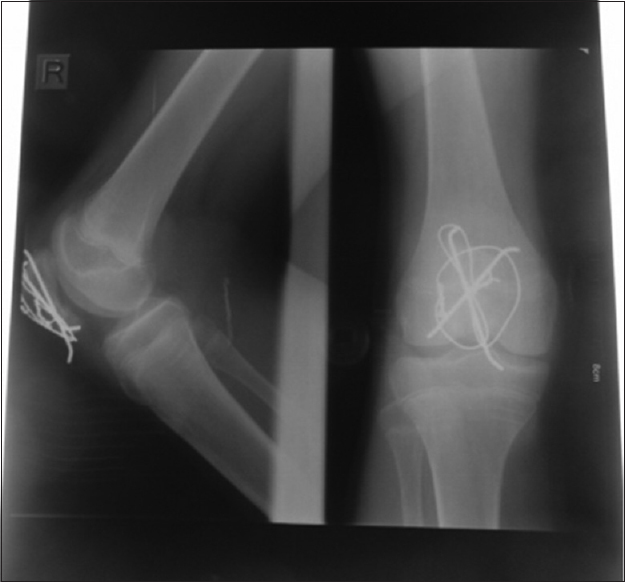 Immediate postoperative radiograph [Figure 2] showed well-positioned tension band wire; however, there was a step at the patella articular surface. He commenced nonweight bearing ambulation on axillary crutches by the 2nd postoperative day, discharged home, and was followed up in the clinic. Back slab splint was removed by 6th week postoperative with good ROM across the knee joint (0°–110°) and he started quadriceps muscle strengthening and ROM exercises. He graduated to partial weight-bearing ambulation and to full weight-bearing ambulation after 2 weeks. Progress of fracture healing was monitored with serial radiographs. Radiograph film [Figure 3] on the 34th week postoperative showed complete obliteration of the fracture line, with good remodeling of the patella articular surface. 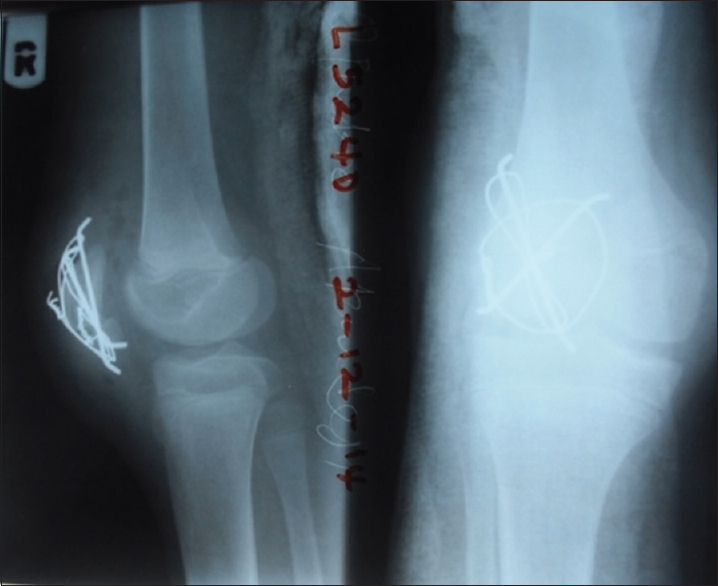 The tension band wire was removed by the 45th week postoperative and the radiographic film after removal showed absence of the fracture line, good remodeling of the patella articular surface, and rough edges of the patella. The fifteenth week after removal of the tension band wire, 60 weeks postoperative [Figure 4], the patella outline is smooth and sharp and articular surface has remodeled. There was no knee pain during activities, no extensor lag, and good ROM across the knees (right: 0°–125°; left: 0°–130°) [Figure 5]. Diagnosis is one of the major difficulties of patella fractures in children  and missed or late diagnoses are common., More importantly, if the patient first presented to non-orthopedic surgeon, and radiographic evaluation was not considered. There was a delay of 2 months in our reported case before diagnosis of patella fracture was made. The case reported by Ndeleva et al. also had 2-month delay before the diagnosis of patella fracture was made. Patella sleeve avulsion fracture is the most common patella fracture pattern in children.,,, This index case is a transverse fracture caused by direct trauma and is an uncommon fracture pattern. The principles of treatment of patella fracture in children are similar to that of adults, which include reconstruction of the extensor mechanism and anatomical reduction of the articular surface. Delay in presentation in adult would have led to nonunion which would have possibly required bone grafting in addition to surgical fixation. It is recommended that open reduction and internal fixation is the treatment of choice for patella fracture in children. Although some studies have shown that conservative management could lead to restoration of the extensor mechanism, it might also result in deformity of the patella and a limited ROM. The described surgical methods of treatment of patella fracture in children are tension band wiring, screw osteosynthesis, fixation with biodegradable pins, or transosseous sutures. We used the option of open reduction and internal fixation with tension band wire in our patient, with the aim of achieving anatomical reduction at the fracture site. Unfortunately, there was a step at the patella articular surface. Since fractures in children heal faster with good capacity of remodeling, the retropatella step was not interfered with and it remodeled over time and the patient can achieved full flexion and extension; and no patellofemoral joint pain. Patella fracture is better not missed in a child and should be efficiently managed. Open reduction with rigid internal fixation gives satisfactory result for patella fracture in a child and little retropatella step will remodel with healing. Jabshetty AB. A comparative study of modified tension brand wiring and cerclage wiring in management of transverse fractures of patella. Indian J Sci Technol 2011;4:1314-21. Schmal H, Strohm PC, Niemeyer P, Reising K, Kuminack K, Sudkamp NP. Fractures of the patella in children and adolescents. Acta Orthop Belg 2010;76:644-50. Wilkins KE. Principles of fracture remodeling in children. Injury 2005;36 Suppl 1:A3-11. Wong KH, Ho ST. Bilateral simultaneous sleeve fractures of the patellae. Hong Kong J Orthop Surg 2003;7:128-31. Labronici PJ, Fernandes HJ, Góes RF, Reis FB. Patella fractures in children (Sleeve-Type Fractures). Acta Ortop Bras 2006;13:253-4. Wu CD, Huang SC, Liu TK. Sleeve fracture of the patella in children. A report of five cases. Am J Sports Med 1991;19:525-8. Houghton GR, Ackroyd CE. 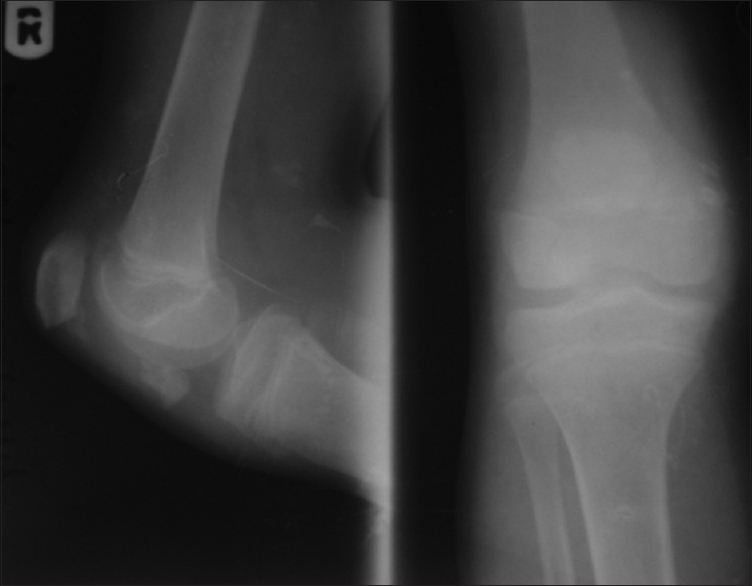 Sleeve fractures of the patella in children: A report of three cases. J Bone Joint Surg Br 1979;61-B:165-8. Belman DA, Neviaser RJ. Transverse fracture of the patella in a child. J Trauma 1973;13:917-8. Ndeleva BM, Lakati CK, Lutomia ML, Mak'Anyengo SO. 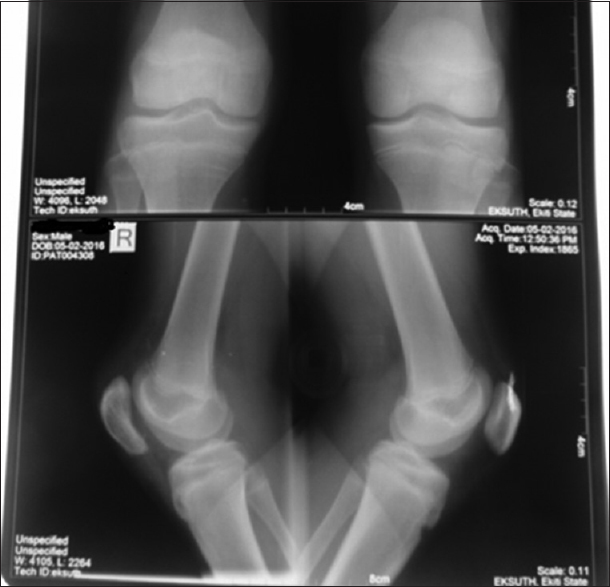 Transverse patella fracture in a ten year old boy: Case report. EAOJ 2013;7:64-6.